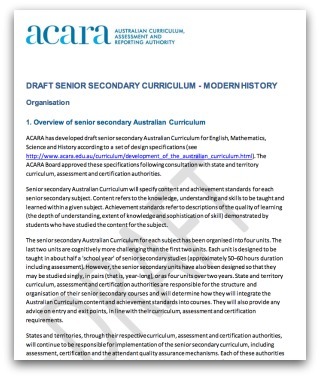 The draft senior secondary history curriculum glosses over Australia's relationship with East Timor. It needs to go beyond the false media and political view that Australia's involvement in East Timor has been unremittingly courageous, generous and exemplary. There is a danger that students will believe Australian soldiers went into Portuguese Timor in 1941 'to protect the Timorese' and that Australia 'saved' East Timor in 1999.